Mary Katharine Foster was born on 17 Feb 1845 in Bangor, Penobscot, Maine to John Burt and Catherine (McGaw) Foster. When Katherine was 15, her family was in the 1860 census living with her grandfather, Jacob McGaw. Jacob was a lawyer in Bangor and her father, John Burt, was a merchant. She had a younger sister, Cornelia and a baby brother, John McGaw. Katherine met her future husband at the Bangor Theological Seminary while attending classes. She was fifteen at the time and it would be several years before they met again. Charles Henry Howard would be caught up in the Civil War and it wasn’t until 1865 when they met again and had the freedom and opportunity to begin a relationship. Charles Henry Howard* and Mary Katharine Foster married on 5 December 1867 in Bangor. Soon afterward the couple moved to Washington, D.C. However, they didn’t stay there long. They headed west to Chicago for Charles’ job. Their first son, Otis McGaw Howard, was born on 24 October 1868 in Washington. Though it is interesting that in the 1870 census in Chicago, Mack (Otis McGaw) was listed as being born in Illinois. In the 1880 census, Charles and Katharine had quite a houseful. Besides their six children, Charles’ mother, Eliza Gilmore was living with them, as well as Emily and Hiram Day, Katherine’s aunt and Uncle. In 1900, all of their children were still living with them and they had added one more daughter, Katherine, who had been born in September 1889. 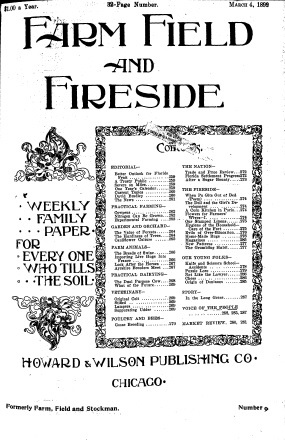 Charles had purchased the agricultural newspaper, Farm, Field, and Fireside, and he worked as the chief editor. Otis was President of the Publishing Company and Nina, their daughter, was an associate editor. Charles Henry Howard died on 27 January 1908 in Glencoe, Cook, Illinois. He was buried in the Rosehill Cemetery and Mausoleum in Chicago. Katharine continued to live in Cook County, Illinois. In 1910, she was living with her daughters, Nina and Katherine. The 1914 edition of the Woman’s Who’s Who of America contained a listing for Katharine that said she was a charter member and had been President several times of the Woman’s Library Club of Glencoe. She favored women’s suffrage and was a member of the Equal Suffrage Association in Glencoe. Katharine and her daughter, Nina, took a trip to Europe in 1924, returning on the 20th of June 1924 to New York aboard the S.S. Canopic. Mary Katharine died 5 September 1927 at the age of 82 in Sacramento, Sacramento, California. She was buried in Rosehill Cemetery with her husband. Otis McGaw Howard was born on 24 October 1868 in Washington, D.C. He died February 1940 in New York. Burt Foster Howard was born 4 September 1871 in Glencoe, Illinois. He died 20 August 1962 in Sacramento, California. Nina Foster Howard was born 2 February 1873 in Glencoe, Illinois and she died 15 August 1942. Arthur Day Howard was born 30 September 1874 in Glencoe, Illinois. He died 12 April 1960 in Los Angeles, California. Lawrence Riggs Howard was born 26 Oct 1875 in Glencoe, Illinois and he died 14 July 1942. Donald Charles Howard was born 28 September 1879 in Glencoe, Illinois and he died October 1963. Katherine Howard was born 25 September 1889 in Glencoe, Illinois. She died 28 January 1981 in Southbridge, Massachusetts. *Note: For more information about Charles Henry Howard, a book was recently published in 2013 by David K. Thomson. It is called “We Are in His Hands Whether We Live or Die.” It expresses Charles beliefs in his own words using letters he wrote during the Civil War period. Maine Births and Christenings, 1739-1900, database, FamilySearch.org (http://familysearch.org). Bangor, Penobscot, Maine, FHL film no. 10,583. Mary Katharine Foster, 17 Feb 1845. U.S. federal census. Year: 1870; Location: Chicago, Cook, Illinois; p. 471B. U.S. federal census. Year: 1880; Location: Glencoe, Cook, Illinois; e.d. 228, p. 525. U.S. federal census. Year: 1900; Location: New Trier, Cook, Illinois; e.d. 1172, p. 7B-8A. U.S. federal census. Year: 1910; Location: New Trier, Cook, Illinois; e.d. 57, p. 17B. David K. Thomson, editor. “We Are in His Hands Whether We Live or Die”: The Letters of Brevet Brigadier General Charles Henry Howard. Knoxville, Tennessee: University of Tennessee Press, 2013. Farm, Field, and Fireside (Chicago, IL), 4 March 1899. Illinois Digital Newspaper Collections. University of Illinois. http://idnc.library.illinois.edu/cgi-bin/illinois?a=d&d=FFF18990304&e=——-en-20–1–txt-txIN——–. John William Leonard, editor. Woman’s Who’s Who of America, 1914-1915. New York, New York: American Commonwealth Company, 1914. Howard, Mary Katharine Foster, p 407. New York, Passenger Lists, 1820-1957, database online. Ancestry.com Operations, Inc., 2010. NARA film T715-3502, p. 114, Lines 19-20. Gen. Charles Henry Howard, Memorial #62176019, database and images online. Find-A-Grave.com. Mary Katherine Foster Howard, Memorial #120287243, database and images online. Find-A-Grave.com.